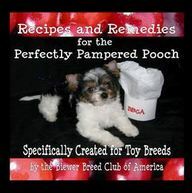 Recipes and Remedies for the Perfectly Pampered Pooch is a cook book compiled by the Biewer Breed Club of America, specifically created for toy breeds. Meals and treats for the pet fancier, a special breeder's section, holistic remedies, tips and tricks are also included. If you are a toy dog fancier, you must have this book and start pampering your favorite pooch TODAY!!! 3 DVD set - $50.00 plus $2.50 shipping/handling.